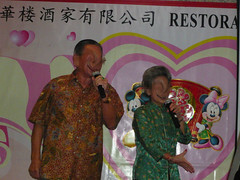 Continuing from the last entry at Restoran Pik Wah, here's my Uncle and Aunt Tay who were the host of the dinner that night. Owing to the fact that they are prominent public figures in KL, I had no choice but to masked their faces to protect their privacy, for I have not gotten explicit permission to have their images displayed on public domain. Now that I have gotten the formalities out of the way, let's get back to today's entry proper. He's 77 and she's 75 years of age and they have been blissfully married for 48 years and counting. With the current divorce rates (for US and I supposed the number is pretty close for Singapore as well) at 53%, I would have to say that the union of Uncle and Aunt Tay is itself a remarkable achievement. So anyway, as we are all familiar with chinese dinners, the appearance of the noodle or fried rice dish is the defacto last dish of the night sans the obligatory dessert and fruits. At that very moment, Uncle Tay literally jumped from his seat and declared that he wanted to sing karaoke! Mind you, we were not in private rooms but smack in the middle of a 30-table restaurant! Next thing we know, we have the restaurant staff scrambling to set up microphones, monitors and music. 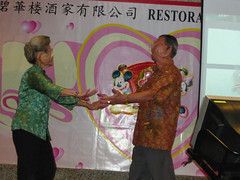 As the dynamic husband-and-wife duo belted out oldies like 上海滩, the whole restaurant literally stopped eating! All eyes were on the two of them as they crooned the tunes. The song finished and the whole house applauded only to be followed by Rumba as the couple started to strut their moves to even louder woots, hoots, cat whistles, applause and whatever, short of setting the restaurant on fire, that you could think of. At the end of the night, we left the restaurant with people from the other tables coming over to the Tays to extend a hearty handshake. A really heart warming scene. This is the life of Uncle and Aunt Tay. Perhaps another trip to Kuala Lumpur in 2 years' time to celebrate their 50th anniversary? and sheesh! the rumba at 77! haha. i do find twirled faces a little scary though. Here's a thought. 77. That's almost 80 and he can still rumba! Imagine that. He is an inspiration to all of us who are younger that we all need to exercise regularly to stay healthy now and for a long time ahead. Only then can you really enjoy the twilight of your life. Nice to read about happy things like that. Just got a divorce news from a friend in SG. If only I get $10 everytime I hear a divorce. sigh. Grasshopper: At $10 a pop, it is still not too bad. Very soon, we will get to $1 for everytime we hear about a divorce. Who Wants To Sell A Hand Chicken?